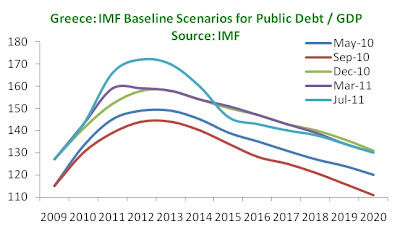 In its Fourth Review of the Greek program, the IMF revised (again) its baseline scenario for Greek debt to 2020 (see here and here for past estimates). The numbers in the outer years have not changed: the 2020 figure is the same at 130% of GDP. But the IMF has changed its 2011-2015 outlook. 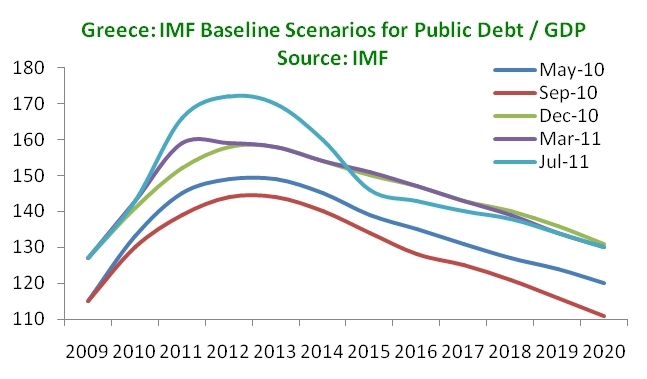 Based on the new numbers, the IMF expects Greek public debt to peak at 172% of GDP in 2012. To put this in context, when Greece first agreed to a bail-out package in May 2010, its debt was supposed to peak at 149% of GDP in 2012 and 2013. The latest revision thus marks a 23 percentage points worsening in 15 months, which is equal to ~€52 billion! The revision, according to the IMF, comes from “higher estimated upfront FSF funding needs.” The Financial Stability Fund (FSF) is there to “ensure that banks in Greece remain adequately capitalized during the downturn to preserve stability.” According to the IMF, “The baseline assumes an additional contribution to the FSF of €16 billion. It is assumed that these funds are disbursed to banks in the near term, with the government recovering the resulting equity investment by 2014–15.” In other words, this extra debt comes from the need to shore up the banking sector which continues to face serious pressures (see here). 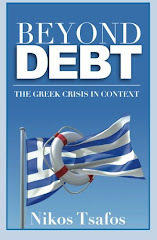 These results are not surprising but they underscore certain underlying themes: first, the debt outlook has deteriorated almost every time that the IMF has issued a country review, and this time the number of 172% pushes Greece into highly unsustainable territory; second, the ability to return to markets looks progressively worse as the debt-to-GDP continues to both climb and stay high; third, liabilities towards the banking sector are a major downside risk; fourth, privatization is indispensible; and fifth, it always comes back to growth, growth, growth.